Bottle brushes also called flue brushes, bottle brushes are a type of brush in which the bristles radiate from a central stem and are most commonly used for cleaning hard to reach areas in bottles. Bottle Brushes Bottle brushes also called flue brushes, bottle brushes are a type of brush in which the bristles radiate from a central stem and are most commonly used for cleaning hard to reach areas in bottles. There are a wide variety of bottle brush configurations because they are designed to work best for various bottle shapes, specifically ensuring the right size to get into the bottle's neck. Typically linear, some bottle brushes are curved to better suit the shape of the bottle. Bottle Brushes - Tanis, Inc. Different bottle types and shapes that bottle brushes are used to clean include water bottles, baby bottles, thermos bottles, vinegar bottles, narrow-necked bottles, coffee cups, carboys, flasks or beakers. Bottle brushes are useful in a broad range of industries including laboratory, pharmaceutical, residential, food processing, industrial, medical, electronics and petrochemical. There are two types of bristle materials commonly used in bottle brushes: metal and nylon. Metal bristles are extremely stiff and are used for heavy scrubbing applications, while nylon is more flexible and is used for lighter scrubbing applications. Metal type materials used for bristles include stainless steel, brass and carbon steel, however nylon bristles are much more commonly used. Bottle Brushes - Gordon Brush Mfg. Co., Inc. Bottle brushes use filaments that allow brushes to be impervious so that the bristles do not imbibe dirt, dust or other contaminants. Bottle brushes are a type of twisted-in wire brush and are made by taking a length of wire doubled over, placing the bristles in between the top and bottom of the doubled over wire, and twisting it up similar to a rubber band. 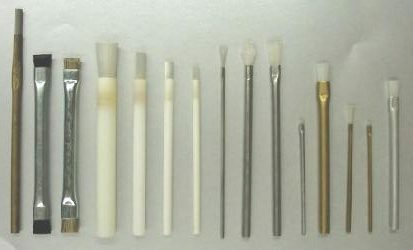 Two less common bristle configurations include the bristles being located at one end of the brush, the handle extending from it and the bristles being centered in the wire with two long ends on each side of the wire. The handle is usually the piece of twisted wire and is most commonly made from galvanized steel, stainless steel, aluminum or brass; however, a thicker type of bottle brush may use a sturdier plastic handle.